Whether it's a tropical island paradise or a mossy northwest forrest, island vibes tend to be the same - easy, breezy, and full of smiles. The San Juan islands are no exception, bagging the second spot on Travel + Leisure "World's Friendliest Islands" in 2015. There are 172 islands in the San Juan islands but only four are reachable by ferry: San Juan, Orcas, Lopez, and Shaw. A few weeks ago the San Juan Islands Visitors Bureau invited me out to explore Orcas island to help kick off summer. Brad and I drove up in our van on a Monday evening, sleeping at a rest stop before arriving at Anacortes the following morning to catch the ferry. Getting tickets for the ferry can be difficult on the weekends unless you plan in advance so I highly recommended visiting the islands during mid-week if possible. Ferry tickets can be purchased on the Wave2Go website. We took a ferry to Orcas Island arriving in the afternoon to sunny skies. 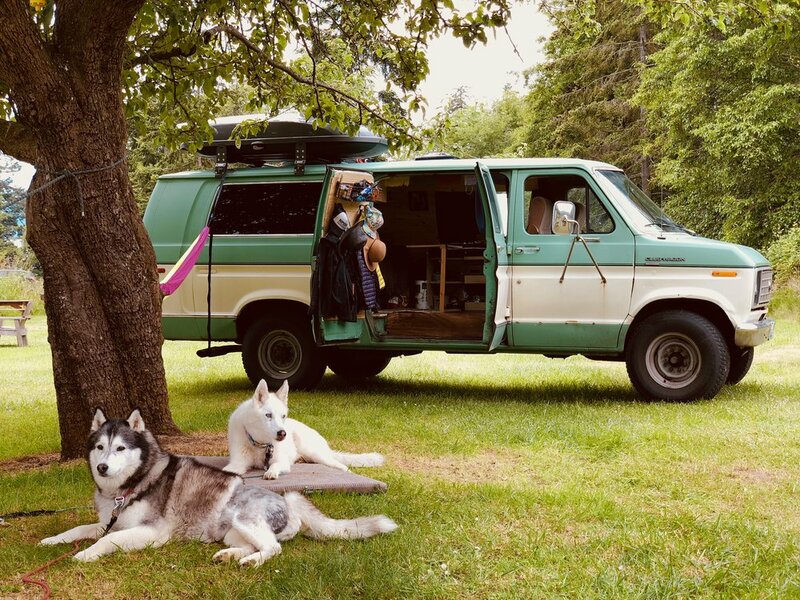 The visitors bureau set us up with an awesome van/dog friendly campsite for two nights at West Beach Resort. West Beach Resort is a private getaway offering beachfront cabins, tent cabins, and camping options for their guests. The resort has all the amenities including a hot tub, showers, marina with a beachfront bar and store, and free wifi. Our campsite was just a short walk from the beach and included a picnic table and fire pit. It was a quiet peaceful spot with no interruptions and plenty of space for the dogs to explore on leash. 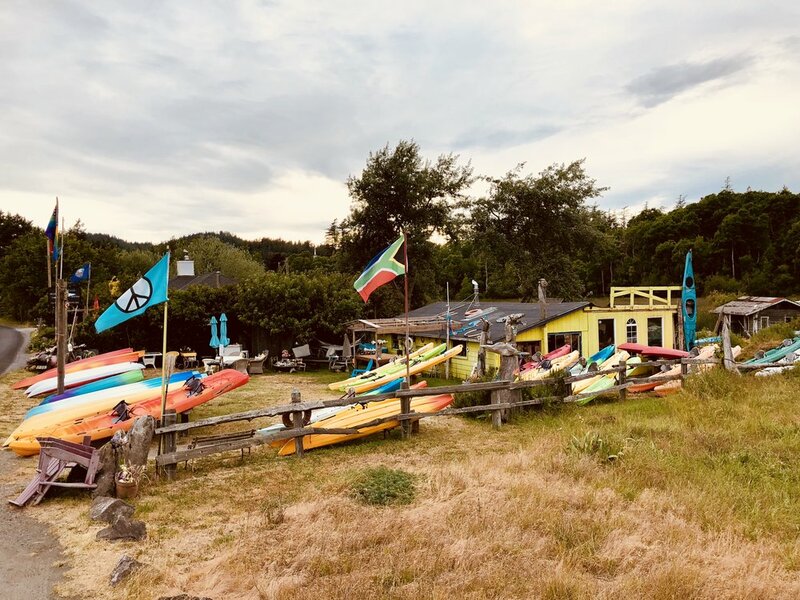 The perimeter of Orcas Island is only about 77 miles with an area of approximately 37,00 acres, making it easy to explore in just two and a half days. Beautiful San Juan County has been dedicated to preserving its natural landscape, making it the first county in the U.S. designated as a Leave No Trace area. The locals are friendly and eager to give tips on their favorite trails and places to catch a sunset. There are no traffic lights on any of the islands - honking is frowned upon so most people just wave. As adventurists who also love food we wanted to make sure we packed in all the best things to do, see, and eat while on the island. We couldn't fit everything in, and definitely plan on visiting again (with whale watching in the books for next time), but I'd say our first visit to the San Juans was perfect. I can see why San Juan County residents are ranked number one in the state for quality of life and physical and mental health. 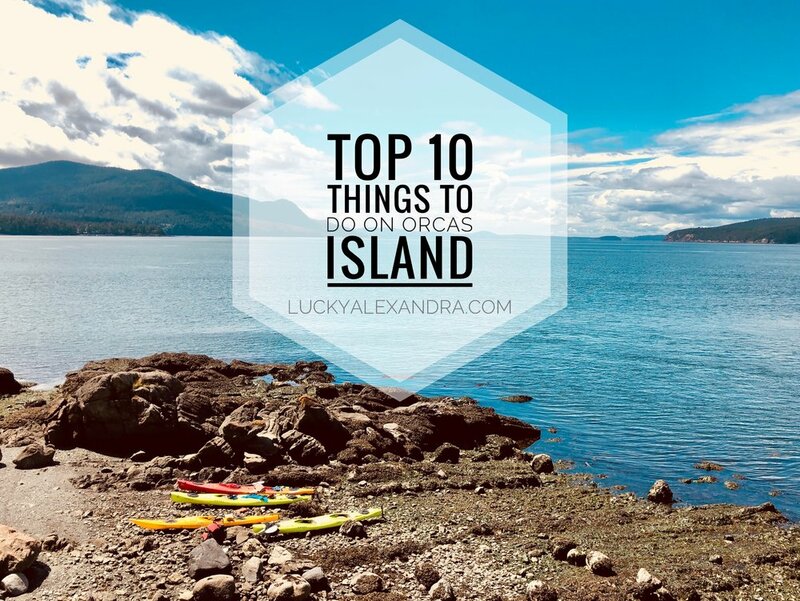 Below are my top ten recommendations for things to do on Orcas Islands. 1. Eat all the seafood - Stop by Buck Bay Shellfish Farm, pick out your own oysters, clams, and/or crab and enjoy them at picnic table in the sun. Buck Bay has beer and wine or you are welcome to bring your own. 2. Get on the water - Take a guided fishing or whale watching trip or head out for a scenic 3 hour kayak tour with Outer Island Excursions. Their guides provide all the gear and you'll be sure to see a bald eagle or two! 3. Hike for some summit views - Head to Moran State Park to hike 6.7 miles to the top of Mount Constitution for incredible 360-degree views of the islands, mainland, and nearby peaks. If you're short on time or not into hiking you can opt to drive to the top instead. 4. Drink the local beer - Serving seven beers on tap, available in pints or flights, Island Hoppin’ Brewery is the perfect place to relax with some refreshing brews. Their patio is dog friendly and they welcome you to bring your own picnic or try some of their pup snacks. 5. Relax in the woods - An afternoon at the Doe Bay Resort & Retreat spa is a must. The clothing optional spa includes three outdoor saltwater soaking hot tubs, a sauna, outdoor shower and an on-site bathroom. The Day Visitor drop-in fee is $15 per person. 6. Eat local food - The Kitchen serves up fresh Asian inspired dishes in a courtyard in the heart of Eastsound. Counter service, picnic style dining, and a commitment to supporting local island farmers guarantees a delicious meal. 7. Catch a sunset - Head to West Beach Resort for sunset at their marina that features a beachfront patio and bar, and serves up free popcorn during sunset on Friday and Saturday evenings. 8. Feed your sweet tooth - The flaky almond-coated bear paw pastries and chocolate croissants are to die for at Brown Bear Baking. Get there early before all the goods are sold out! 9. Visit the heart of the island - Spend an afternoon exploring the Eastsound village strolling through local shops and galleries. On Saturdays (May-September) you can visit the Farmers Market from 10am-3pm. 10. Get your jam on - Stop by the Girl Meets Dirt tasting room for a sampling of their delicious small batch heritage preserves. 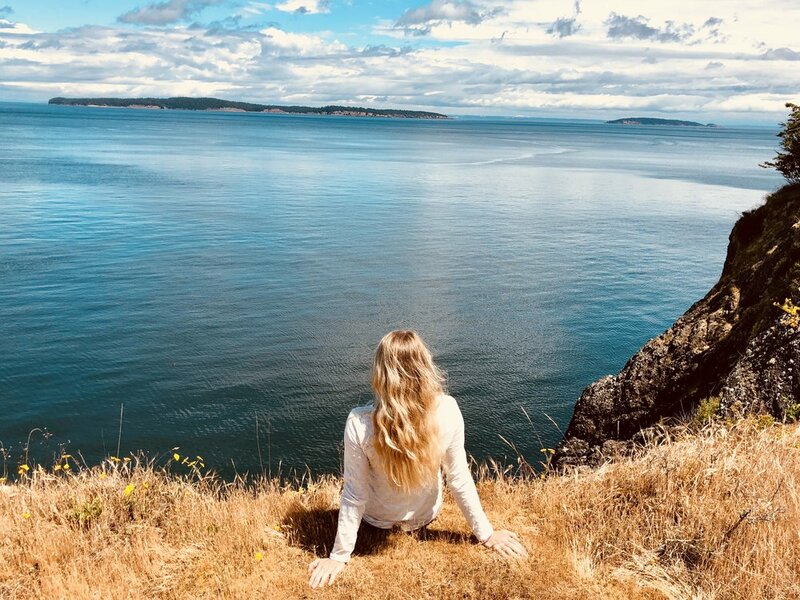 This post was sponsored by the San Juan Islands Visitors Bureau.